The tour continues. My original plan was to hit Nash Stream and the Andro. Unfortunately, the weather forecast for Saturday didn’t look too good so I didn’t go north and stay the weekend like I planned. On Saturday morning, I decided to hit a blue line near Durham instead before it started to rain. 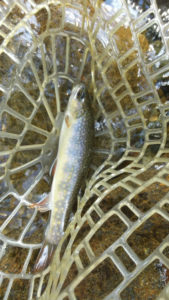 I caught 3 tiny brookies, missed many, and spooked even more. 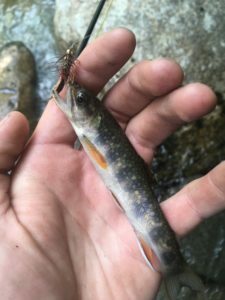 I was shocked to find trout in the brook since part of the woods near the brook was clear cut and the bottom of most pools was silty. It’s truly amazing to see how resilient these fish are in the face of oncoming development. I really wish that there was legislation in place to prevent development within 100 ft of any stream containing a wild trout population. 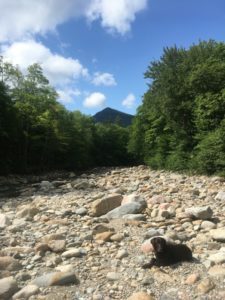 On Sunday, I spent the entire day exploring the upper Pemi. wilderness with my friend Colby. 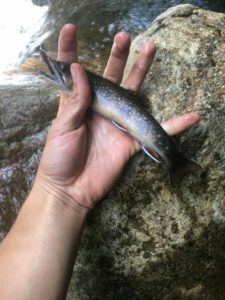 The main branch and east branch were absolutely ripping due to the rain the night before so we walked upstream to find some more fishable water. On the way, we hit a couple of feeder streams. Although I missed one fish on a dry, they weren’t rising very much in the morning. On the flip side, Colby did well early on using wooly buggers. Once we reached our spot, the action had really picked up. 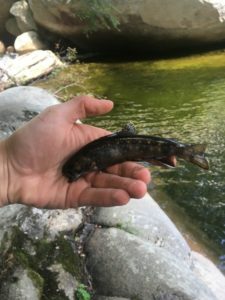 I caught fish using nymphs early on. Flashback pheasant tails and hare’s ear were the hot flies. I caught many small fish, while Colby weeded out some of the larger fish. He used a combination of wooly buggers, small clouser minnows, and spinners (I jokingly called it cheating). After I broke off my second nymph rig, I decided to start throwing dries. By this time, the fish were much more willing to hit on top. We caught fish of all sizes but by this time, the larger fish had come out to play. Top flies were orange stimulators, olive EHCs, and black gnats. Eventually, we were forced to turn around since we had to hike back at least 4 miles back to the car. On the way back, we stopped at a few more spots and caught more natives. 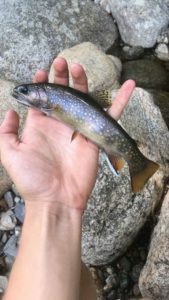 Colby caught the first and only stockie close to the main trail. To sum it up, this was a great second leg of my current tour and I look forward to trying some more new areas next weekend. Very neat video! I’ve been trying to get some decent shots of trout with my go pro mounted on the net. Not so great yet, but yours was really excellent. Thanks Steve! I usually just point the camera at the fish as it’s swimming away. I think the net mount would shoot some really neat landing shots but if you want to get some release shots, I’d suggest detaching the camera and following the fish by hand.